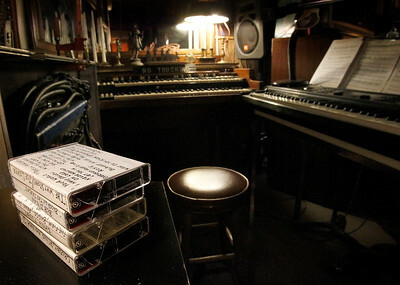 Matthew Apgar - mapgar@shawmedia.com Cassette tapes sit on a tape surrounded by songbooks and keyboards in the downstairs apartment on Thursday, June 4, 2015 in Woodstock. The home, which is currently converted into four apartments, is up for sale and has been a musical venue for numerous performers, including Pete Seeger, whose signature adorns the wooden beams in the ceiling. 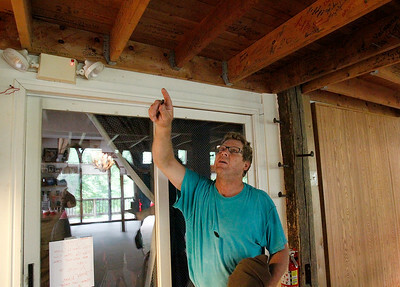 Matthew Apgar - mapgar@shawmedia.com Peter Mast points to signatures adorning the great room ceiling on Thursday, June 4, 2015 at his Woodstock home. The home, which is currently converted into four apartments, is up for sale and has been a musical venue for numerous performers, including Pete Seeger, whose signature adorns the wooden beams in the ceiling. 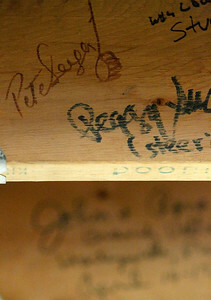 Matthew Apgar - mapgar@shawmedia.com Pete Seeger and sister Peggy Seeger are among the many signatures on the wooden beams in the great room ceiling on Thursday, June 4, 2015 in Woodstock. The home, which is currently converted into four apartments, is up for sale and has been a musical venue for numerous performers, including Pete Seeger, whose signature adorns the wooden beams in the ceiling. 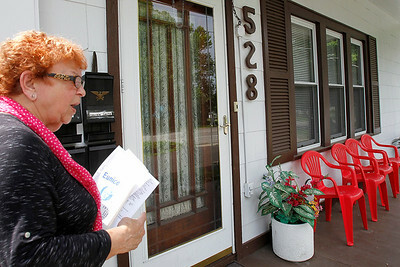 Matthew Apgar - mapgar@shawmedia.com Keller Williams real estate agent Tina Martin walks up to the porch of her listing at 528 East Calhoun Street on Thursday, June 4, 2015 in Woodstock. The home, which is currently converted into four apartments, is up for sale and has been a musical venue for numerous performers, including Pete Seeger, whose signature adorns the wooden beams in the ceiling. 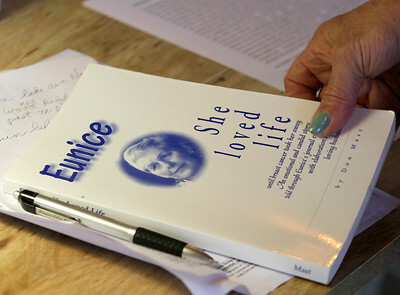 Matthew Apgar - mapgar@shawmedia.com Keller Williams real estate agent Tina Martin holds a copy of the 1996 book "Eunice---She Loved Life", a paperback publication of Eunice Mast's journal entries through her fatal bout with breast cancer, on Thursday, June 4, 2015 in Woodstock. 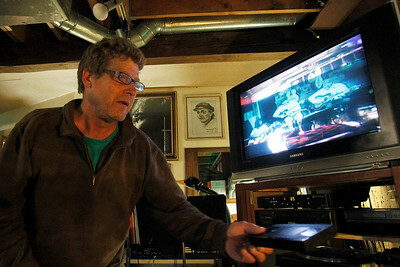 Martin is listing Mast's Woodstock home, which has a long-standing history of musical gatherings. Matthew Apgar - mapgar@shawmedia.com Eunice Mast's son, Peter Mast, reaches on Thursday, June 4, 2015 for a VHS tape of musical performances held at his Woodstock home when he was younger. The home, which is currently converted into four apartments, is up for sale and has been a musical venue for numerous performers, including Pete Seeger, whose signature adorns the wooden beams in the ceiling. 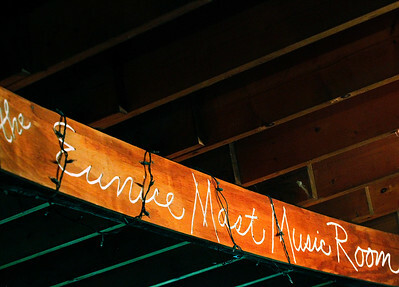 Matthew Apgar - mapgar@shawmedia.com A large sign reading "The Eunice Mast Music Room" adorns the basement ceiling on Thursday, June 4, 2015 in Woodstock. The home, which is currently converted into four apartments, is up for sale and has been a musical venue for numerous performers, including Pete Seeger, whose signature adorns the wooden beams in the ceiling. 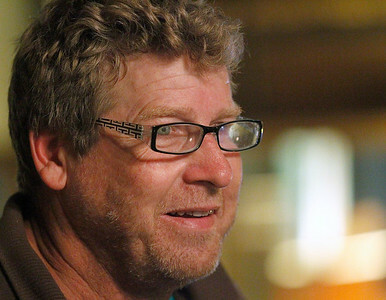 Matthew Apgar - mapgar@shawmedia.com Eunice Mast's son, Peter Mast, lives in the basement apartment of the home, which resembles a small coffee shop with multiple little tables lit by candlelight on Thursday, June 4, 2015 in Woodstock. The home, which is currently converted into four apartments, is up for sale and has been a musical venue for numerous performers, including Pete Seeger, whose signature adorns the wooden beams in the ceiling. 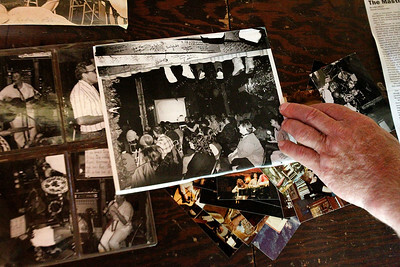 Matthew Apgar - mapgar@shawmedia.com Peter Mast sifts on Thursday, June 4, 2015 through old pictures of musical performances held at his Woodstock home. The home, which is currently converted into four apartments, is up for sale and has been a musical venue for numerous performers, including Pete Seeger, whose signature adorns the wooden beams in the ceiling. Matthew Apgar - mapgar@shawmedia.com Peter Mast, son of the late musician and guitar teacher Eunice Mast, reflects on Thursday, June 4, 2015 on growing up in a musical household. The home, which is currently converted into four apartments, is up for sale and has been a musical venue for numerous performers, including Pete Seeger, whose signature adorns the wooden beams in the ceiling. 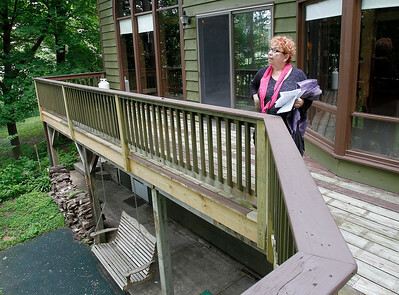 Matthew Apgar - mapgar@shawmedia.com Keller Williams real estate agent Tina Martin looks out upon the back deck of her listing at 528 East Calhoun Street on Thursday, June 4, 2015 in Woodstock. The home, which is currently converted into four apartments, is up for sale and has been a musical venue for numerous performers, including Pete Seeger, whose signature adorns the wooden beams in the ceiling. 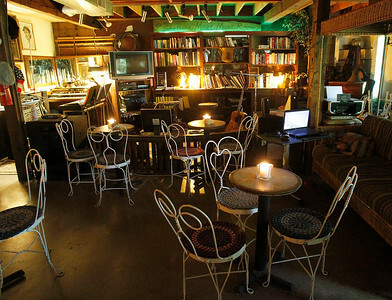 Eunice Mast's son, Peter Mast, lives in the basement apartment of the home, which resembles a small coffee shop with multiple little tables lit by candlelight on Thursday, June 4, 2015 in Woodstock. The home, which is currently converted into four apartments, is up for sale and has been a musical venue for numerous performers, including Pete Seeger, whose signature adorns the wooden beams in the ceiling.